Finns Party leaders party after election fightback! 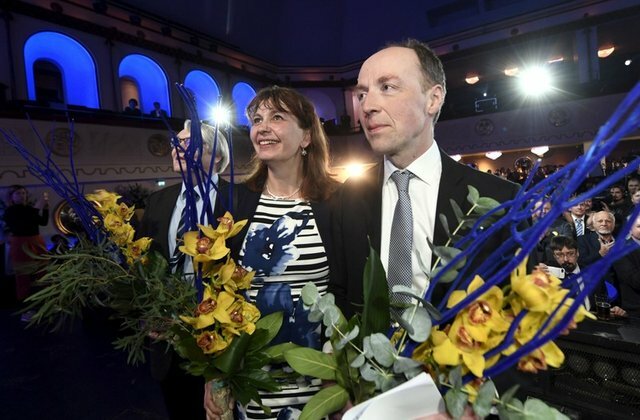 After looking dead and buried following a damaging party split in 2017, the nationalist Finns Party (aka the True Finns) has bounced back to claim second place again in Finland’s general election at the weekend. The Social Democrats (Finland’s Labour Party) just topped the polls, the first time since 1999, with 17.7% of the vote, winning 40 seats in the 200-seat national parliament, one more than the Finns Party, which finished a strong second with 17.5% of the vote. The ruling Centre Party slipped to fourth place, beaten by its coalition partner the National Party, which finished just behind the Finns Party. While another coalition partner, Blue Reform, an offshot from the Finns Party following the 2017 split, was wiped out. A former leader of the Finns Party Timo Soini had stayed in the coalition government after a successful leadership challenge by ethno-nationalist Jussi Halla-aho (pictured above) had led to a rump of the party’s MPs setting up the splinter Blue Reform party, which now faces electoral oblivion after its disastrous showing. The Finns Party combines socialistic economic policies with conservative social values and ethnic nationalism. Although described by the liberal media as “far-right”, it describes itself as a “centre-left workers’ party”. Before the election, most of the parties had ruled out working with the Finns Party expecting it to be sunk by the recent split. It also remains to be seen whether the Social Democrats will work with the Greens and far-left, who won 36 seats between them, or whether some kind of ‘Grand Coalition’ is engineered by the old mainstream parties, which formally excludes the Finns Party boosting its appeal as a result. Although previously attached to UKIP, the Finns Party has already announced an alliance with Germany’s AfD, Italy’s League party led by Matteo Salvini, and the Danish People’s Party, with other anti-immigration parties expected to join, including Marine Le Pen’s National Rally in France, before the EU elections in May. A short video on recent events in Finland (and Denmark) can be viewed below. Next Post The Fall of Europe?